I got a couple hours of mediocre sleep… woken up by a film crew outside at 2AM and the constant sound of a crying baby. Kelsey returned to the tent with the baby sometime between 4:30 and 5:00 AM… having carried the team for us and doing an AMAZING job. There’s something to be said about specialization… she learned every little trick, strategy, and how do deal with the little bugger. When the transition to Joni took place, I knew it was my job to be in “go mode”. Joni preferred to be in the tent to out by the fire, so I moved my sleeping bag beside hers so we could work together. While I was ready to be up and assist at all times, Joni encouraged me to sleep and only help when the baby cried. More than anything, my job was to keep Joni positive. Her mothering instincts are very strong, and initially she felt a crying baby was a poor reflection on her mothering. I had to take the much less maternal view and remind her we were literally dealing with a robot and computer program. While the crying was loud and sporadic, eventually something beautiful happened – the baby went to bed for 3-4 hours. Hallelujah! The baby had a few more big cries when the crew arrived, but FINALLY around 11:30 the key went in the baby’s back and we were done. Now all we could do was cross our fingers and wait. FML… we weren’t perfect, but Kelsey and Joni did great. We heard their baby cry a lot too, how much better could they have done?! Well geeze. I’m not particularly religious, I simply try to treat everyone I encounter with respect, and I try to be appreciative of all that I’ve been given in life, and do my part to give back. I try to give credit where credit is due, and acknowledge others who help me, because nobody gets anywhere completely on their own. I was happy to win, no doubt, but the win made me think of “lucky” in every sense of the word. Lucky to be on a team of skiers. Lucky to have Kelsey and Joni carry the team, my contribution was relatively small this week yet because of them we’re moving on. Lucky to have great parents who put up with me when I was behaving like Haakon Haakonson as a child. Lucky to have a job that let me take off for up to 10 weeks to go on this crazy adventure. Lucky to be in one of the most beautiful countries in the world, when most Americans don’t even have passports. Lucky to be a part of a production that treats us like kings (no pun intended) and genuinely wants us to have an amazing experience even off camera. There are so many things to be thankful for that are beyond my control, but on a selfish level, I was thrilled to win this competition because it ensures that I’ll be in Norway on Syttende Mai – the 17th of May – or Norwegian independence day. For 27 years I’ve attended the Syttende Mai parade in Ballard – it’s the biggest day of the year in my neighborhood, and the biggest Syttende Mai parade in the world outside of Norway. As a child, the parade is how I learned about Norway, and what it meant to be Norwegian. Even 6 months ago I never dreamed of being in Norway, much less for the celebration, but now it’s looking like that will be a reality. How incredibly lucky. After the announcement came interviews, then lunch. 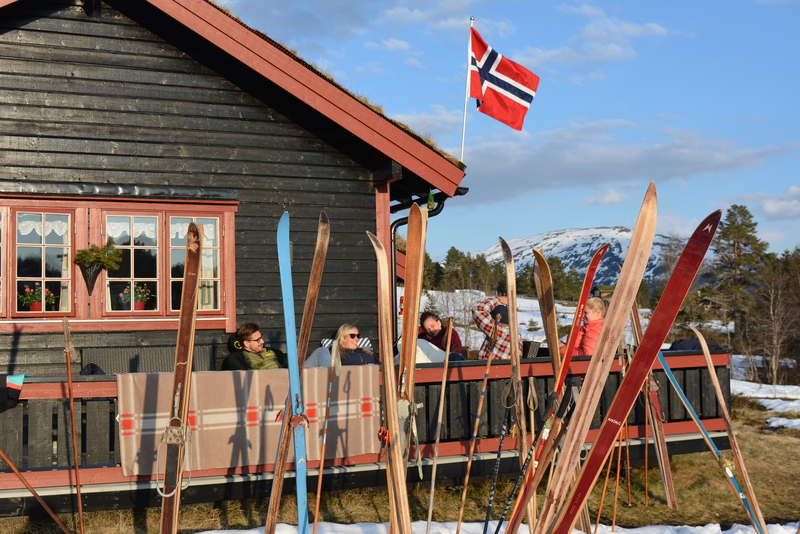 Next was a bonfire chat with Fridtjof who told us we’d be going on a ski tour! Sick! After dinner, most people immediately crashed from a complete lack of sleep the night before. Joni and I went for an hour walk to the top of the hill over town and took some amazing photographs. Even though I’m in the moment as I write this, still, none of it seems real at all. I’m so lucky.